An exhibition of photographs, paintings and prints of the celebrated Himalayan mountain Kangchenjunga will take place in the Alpine Club gallery to coincide with the 50th anniversary of the first ascents by a team of British climbers in May 1955. 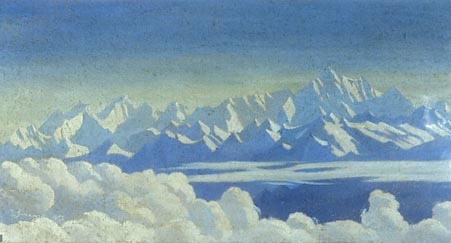 'Sunrise over Kanchenjunga'(sic) from Darjeelng, watercolour by T Howard Somervell, Everest climber, probably painted in 1922 or 1924 en route or returning from the Tibetan side of Everest. The exhibition and an accompanying 128 page colour illustrated catalogue will survey the history of Kangchenjunga as a pictorial and literary subject and examine the differing ways in which it has been seen and interpreted by British and European artists, photographers, mountaineers, poets, authors and travel-writers over the period c1848-2005. The third highest mountain in the world has been a topographical feature to be sketched, mapped and surveyed; it has been seen as an emblem of colonial possession; later an embodiment of the sublime, a picturesque motif, a mountaineering challenge, a peak conquered but left un-trodden; and recurrently throughout all of these, a sacred mountain and symbol of spirituality. Added to all of these ways of seeing Kangchenjunga is the significance of the mountain to the Nepalese and Sikkimese people who live in its shadow, and to whom the mountain is symbolically the residence of a god. Many have been captivated by Kangchenjunga’s magnificence, its transient and ethereal qualities, hovering, or so it seems, above the clouds, half-hidden and indeed sometimes even mistaken for a cloud. As a subject Kangchenjunga has an important place, not only in the history of British mountaineering, but also within the sublime and romantic traditions of British and European art. The exhibition, curated by Simon Pierse, has been jointly organized by the Alpine Club and The University of Wales, Aberystwyth. All photographs are in the Alpine Club Collection. Please do not copy them. If you would like to use any of these, or other AC photos, please contact the Photo Library by emailing photos@alpine-club.org.uk.